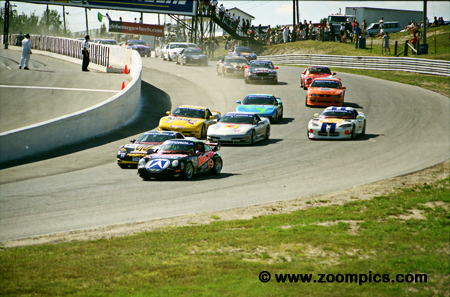 In early August, Mosport hosted the eighth round of the 2000 Motorola Cup. With only two events left and many championships yet to be decided drivers and teams had to balance risk with reward when thinking about their race strategy. The Porsche 911 Turbo driven by Richard Spenard and Jean-Francois Dumoulin entered the Mosport round with two wins and four podiums in only five races. They added to these statistics with another win but not before they overcame a stop-and-go penalty. The NewTech team was penalized twenty-seconds for having too many men over the wall. Apparently, a member of a TV crew was mistaken for one of the team members. It is Saturday afternoon and forty-five cars funnel into Mosport’s corner one for round nine of the Motorola Cup Championship. The NewTech Porsche gets the jump on the pole sitting Phoenix American Corvette. Close behind are the series top SGS Corvettes and the point leading Dodge Viper of Amick Racing. The combination of Howie Liebengood and Andy Lally came on very strong as the 2000 season wrapped up. 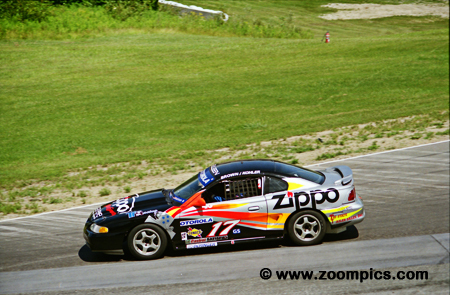 Heading into Mosport the duo had captured three poles and three wins in the last five races. Driving a BMW 328, they scored another victory at Mosport which padded Liebengood’s championship lead in the Sport Touring class. Finishing third in the C2K class were Honda Civic Si drivers Bryan Johnson and Pete Halsmer. 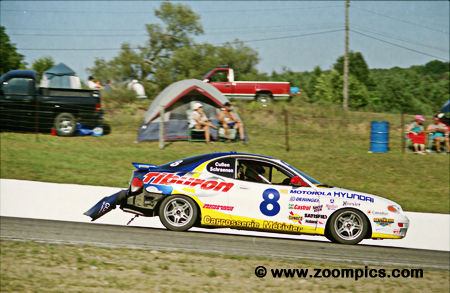 Johnson was in a season long battle for the Driver’s title with Hyundai Tiburon competitor Mark Craig. 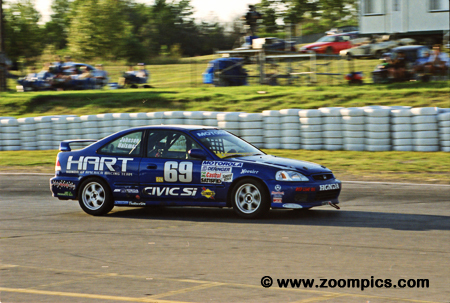 Craig and his co-driver Jocelyn Hebert finished fourth at Mosport which allowed Johnson to increase his lead to seventeen points. For Mike Fitzgerald and Michael Culver, it would be their third second place finish of the season. 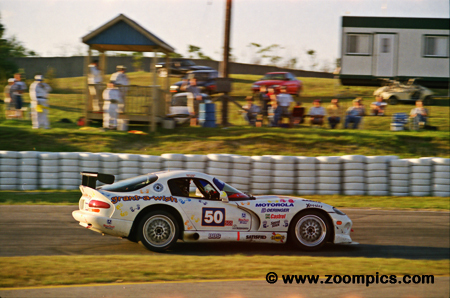 In 2000, Fitzgerald had a very busy season also competing in the ALMS, Grand Am and World Challenge series. In ALMS, Grand Am and World Challenge GT he was driving a Porsche and was leading the International Porsche Cup standings. John Kohler and David Brown qualified second in the Grand Sport class. 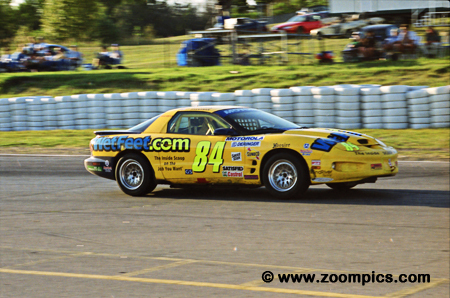 On the first lap, they passed Stu Hayner in the pole sitting Grand Sport Pontiac Firebird and never looked back. The Ford Cobra R drivers led flag-to-flag and finished a lap in front of the second place Grand Sport Chevrolet Camaro of Jocelyn Hebert and Rejean Vincent. Canadian open wheel racing veterans Gord Cullen and Didier Schraenen shared the No. 8 Hyundai Tiburon. Near the end of the race, Schraenen was within striking distance of C2K class leader Peter Cunningham. But Cunningham in a Honda Civic Si could pull away at will. Cullen and Schraenen would finish second to the winning HART Honda. The No. 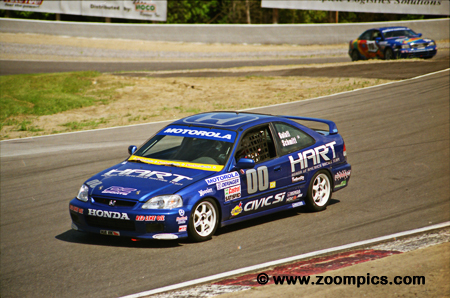 00 HART Honda Civic Si qualified sixth in the C2K category. 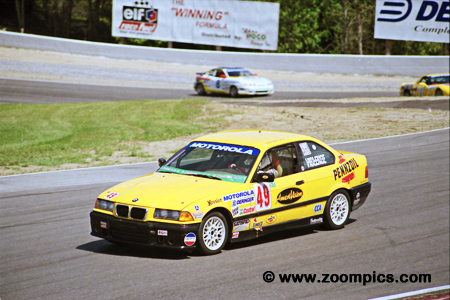 This car was shared by John Schmitt and, veteran showroom stock endurance racer, Peter Cunningham. The pair moved up the order and were able to take a relatively easy win with Cunningham at the wheel during the final stint. 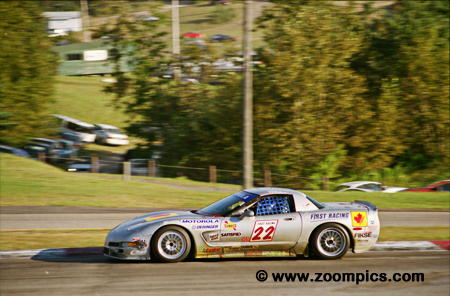 John Heinricy put Phoenix American Motorsports Chevrolet Corvette on the SGS pole. He shared the driving duties with 1998 Motorola Cup Touring Champion Paolo Dal Cin. The duo was having a strong run when mechanical issues dropped them to a seventh place finish. 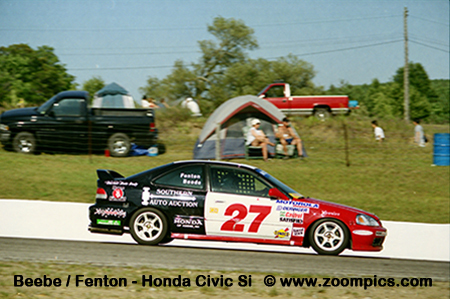 The 2000 Manufacturer’s Championship in Grand Sport had been a season-long battle between Ford and Pontiac. 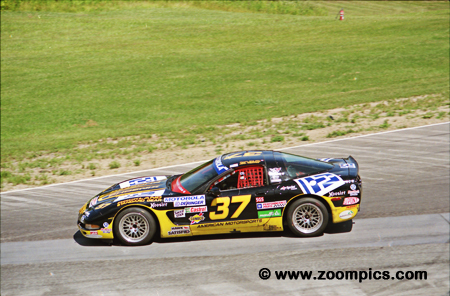 Finishing second in this class was the Chevrolet Camaro SS driven by Jocelyn Hebert and Rejean Vincent. Ironically, this result negatively impacted General Motors title aspirations by taking away points from the Pontiac brand. When the TF Racing Ford Mustang Saleen was withdrawn Terry Borcheller was left without a ride. Chuck Goldsborough was quick to recruit Borcheller and early in the race it was looking good for the No. 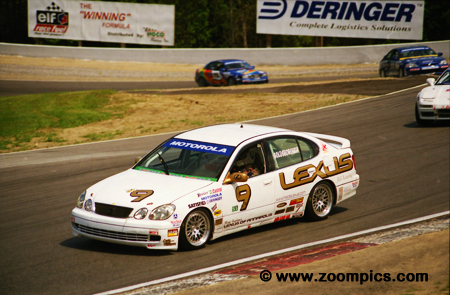 9 Lexus GS400 – they set the fastest race lap. Unfortunately, they were forced to retire after 55-laps with mechanical problems. The father and son team of Sam and Brett Shanaman could only qualify their Pontiac Firebird eleventh in the Grand Sport category. During the race, the title contenders moved up to third in class only one lap behind the Grand Sport victor. This result closed the gap on championship leaders, Wortzman and McCalmont, who finished eighth in class. The Planet Earth Motorsport Corvette was running third in the closing stages of the race when motor issues forced the team to retire. Benefiting from their misfortune was the No. 50 Team Amick Motorsports Dodge Viper. 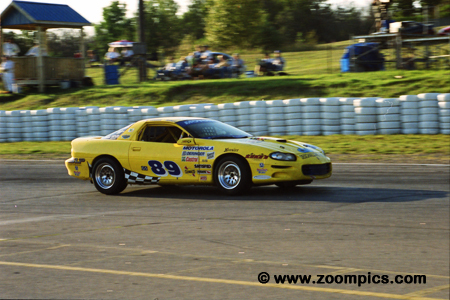 This allowed Joe Varde and David Amick to finish third overall and in the Super Grand Sport category. 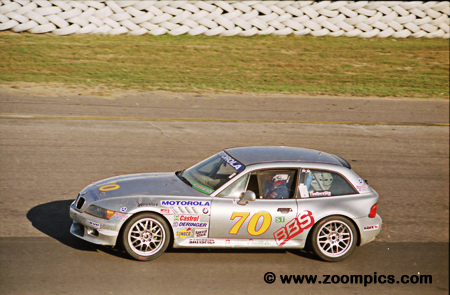 The Team Spartanburg Racing BMW Z3 Coupe co-driven by Ray Shaffer and Jeff Trask finished third in the Sport Touring category. At this point in the season, Trask was third in the standings which could be attributed to the reliability of the car. In fact, Trask had only finished out of the top five twice. 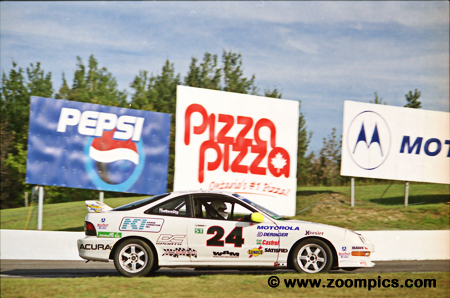 Finishing second the Sport Touring class was the Power Racing Acura Integra Type R. Driving the car were Jason Potter and Michael Keravich. This was Keravich's first podium of the season. Potter already had a finish on the podium at Mid-Ohio with Power Racing.